Every Republican in the U.S. Senate, including both Alaskans, voted Wednesday to officially begin debate on a tax-cut bill that would also open the Arctic National Wildlife Refuge to oil drilling. “On this vote, the yeas are 52, the nays are 48 the motion is agreed to,” the Senate’s presiding officer announced. The procedural vote allows the Senate to vote on the tax bill itself later this week. Opening the Arctic Refuge to oil development has been the dream of Alaska’s congressional delegation since the 1970s. That portion of the bill, though, has hit a technical snag: The Senate parliamentarian has reportedly ruled that part of ANWR language exceeds the limits on what can be included in a budget bill. Sen. Lisa Murkowski says the problem is easy to fix. Murkowski issued a statement to announce her support for the tax bill. 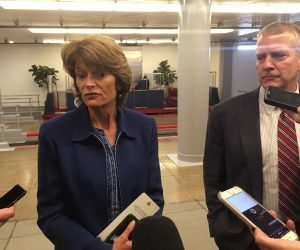 Among the features she likes: Murkowski says it will lower taxes for many Alaska families by doubling the child tax credit and the standard deduction. She also likes that the bill would end the mandate that everyone have health insurance. She says people shouldn’t have to buy policies they don’t want or can’t afford. Critics say ending the mandate will drive up premiums because healthy people will leave the market. Sen. Dan Sullivan supports the tax bill, too. He says the tax cuts will spur economic growth. Democrats say the tax cut is a give-away to corporations and the wealthiest Americans. “It’s fairy dust economics to suggest that all this wonderful growth is going to occur and it will trickle down and help everyone else,” Democratic National Committee chair Tom Perez said in an interview with Alaska Public Media. Sen. Maria Cantwell, D-Wash., did not sound optimistic after today’s vote that she and fellow Democrats will be able to block drilling in the Arctic Refuge. “Well, it’s in this bill and it looks right now that people are continuing to move it forward,” Cantwell said, adding there’s still a long process ahead. Cantwell says Democrats will try to raise awareness about the refuge and its value as a place for nature, not drilling rigs.